Tourism industry is the largest sector in which foreign investment is common. The Maldives in the early days of tourism had a relaxed policy to attract investments. This has facilitated private sector involvement and rapid growth in the sector based on market forces. All the islands used as resorts are leased by the government for private individuals or companies. Multinational companies and hoteliers like Hilton Hotels, Club Med, Four Season and One and Only etc… run and manage resorts in the Maldives today. Many Maldives resort owners assign management contracts with foreign companies and some of these resorts are solely managed and owned by such companies. The industry now is very much regulated by the government of the Maldives. Tourism is now developed and managed according to country wide policy based on a master plan. This task is carried out by the Ministry of Tourism. The ministry in the light of their development plan decides how many beds will be allocated in the country for tourists in a given period. 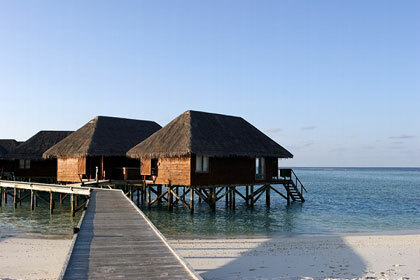 In Maldives the resorts are self contained island communities with all the amenities on the island. Each of these small islands is a resort. The government leases these islands to private parties to develop as tourist resorts. Bidding of the islands are regulated under Maldives Tourism Act 1996. Under this Act any island which is to be developed as a resort shall go on public bid. The bid document is issued by the Ministry of Tourism and it has to be submitted to the ministry before allocated time for each bidding process. The winning bidder is decided based on certain criteria they have set. At present there are 12 islands ear marked for bidding. Bid documents are being issued by the Ministry of Tourism. As tourism sector is a wide industry there are scope for investments in many different related activities such as supply of goods and other services to this industry. This is an unofficial translation of Maldives Tourism Act 1999. This act has repealed the earlier version of which was introduced in 1979, the number 15/79 (Law on Tourism in the Maldives) and Act No. 3/94 (Law on Leasing of Uninhabited Islands for the Development of Tourist Resorts).